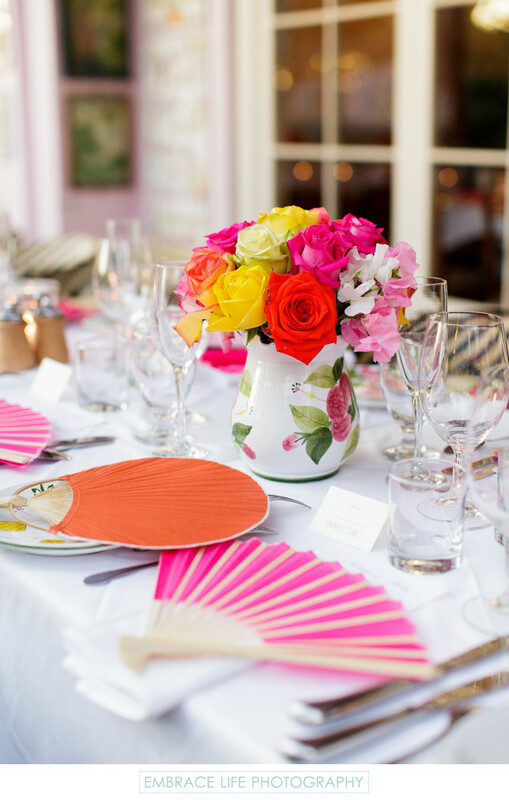 Detail photograph of a colorful rose centerpiece in floral crockery, and fuchsia & orange fans on a table top at a Santa Monica rehearsal dinner at Ivy at the Shore restaurant for a couple who had their wedding at The Viceroy Santa Monica. Both the rehearsal dinner and wedding were planned by Charley King of Bluebell Events. When photographing private parties, Los Angeles event photographer, Embrace Life Photography, captures the essence of the event, including all the details and thought that went into creating a unique party.